At least 11 people have been killed and 25 injured in a suspected suicide shoe-bomb attack at a key Shia mosque in the Iraqi capital Baghdad. The blast hit the Buratha mosque in northern Baghdad, where up to 90 people were killed in a multiple suicide bombing on 7 April. The mosque's imam said he believed he was the target, but was unhurt. Friday's attack was the biggest in Baghdad since a massive security operation came into force on Wednesday. The imam, Sheikh Jalaluddin al-Saghir, told the BBC the suicide attack appeared to have been carried out by a man who had explosives and ball bearings packed into his shoes to avoid detection in security checks. Stringent security measures were put in place at the mosque after April's attack, in which the bombers were said to have been dressed as women. The latest bombing took place shortly before weekly prayers were due to begin, during which Mr Saghir was due to deliver a sermon. The imam, who is also a leading Shia member of parliament, said he believed he was the target of the attack, but added: "This will not deter us, this will not affect the political process." He said the bombing looked like it was revenge for the killing of Abu Musab al-Zarqawi, the former leader of al-Qaeda in Iraq. He was killed last week in a US air strike north of Baquba. Statements apparently put on internet by the militant group vowed to take revenge. Mr Saghir blamed al-Qaeda in Iraq and what he called "Baathists" for the attack. The Buratha mosque has been surrounded by huge concrete blast walls, where visitors are subjected to an initial visual check, says the BBC's Hugh Sykes in Baghdad. The bomber must also have got through a more thorough body check to gain access to the main courtyard of the mosque, he says. He got close to the imam's position, but before the imam arrived, security staff noticed he was still wearing his shoes, which is not allowed in a mosque. He was told to take them off, and appeared to be complying, when the bomb went off. It is believed to be the first time a shoe bomb has been used in Iraq. While extensive security measures have been introduced to many mosques in Iraq, our correspondent says, these are no defence against a suicide bomber who detonates his explosives when approached. The mosque bombing comes despite a huge new security operation in Baghdad. 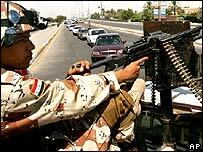 Tens of thousands of Iraqi and US security forces have been patrolling the streets of the capital, on the orders of Iraqi Prime Minister Nouri Maliki. Cars were also banned from the streets of the capital for several hours on Fridays - in an attempt to prevent such attacks on Friday prayers. The measures initially appeared to have reduced the number of attacks. However, at least two people were killed when a barrage of mortars slammed into a northern district of the capital on Friday. On Thursday, a bomb in a parked car detonated in the south-west of the city, killing at least three civilians and wounding 14. Elsewhere on Thursday, gunmen shot and killed 10 workers riding a bus in Baquba.